Stephen Kruger’s book, Crescent and Star, is about change. Once, Turkey was the center of the world.. Even Homer’s writings are now believed to have been based on fact, according to archaeological findings. In this in-depth look at Turkish culture and politics, Kruger takes his readers from smoke-filled nargile salons to the halls of Turkish government. To the Turks, Mustafa Kemal Ataturk, is the consumate hero. According to Kruger, there’s much to justify Turkey’s reverence for Ataturk. He helped Turkey to rise from defeat and emerge as a vibrant new nation. It’s been a century since Ataturk began his rise to power, overthrowing the last reigning sultan. Kruger shows his readers the depth and breadth of Turkish history with in-depth reportage, recreating the events that shaped modern Turkey. Short escapes describe Turkish culture, like going to a nargile salon, where Turks gather to smoke water pipes and socialize. Kruger shows how even these are changing. In the 19th century, they were status symbols. Today, they’re mere smoking parlors, which foster smoking as an acceptable practice, especially among men. He takes his readers with him into his cell after being arrested and interrogated after driving into the Kurdish war zone. The Turks are well known for their intensive and sometimes highly physical interrogation. Kruger was visibly shaken by the incident, proving that he couldn’t let his guard down even in a country he knows so well. According to Kruger, Turkey has the worst human rights record of any free country. He says that Turkey’s failure to keep peace among its people is the single greatest reason for its failure to integrate itself fully into the community of civilized nations. In modern Turkey, expressing provocative dissent is a crime. Kruger says Turkish laws that stifle public discourse are one of the reasons Turkey has won a reputation for poor human rights. Turkey is well known for its abuse of criminals. Kruger describes how detectives use informers to find suspects–even if those suspects are innocent. Rarely do prisoners deny charges against them. This book is a heavy, albeit interesting, read. 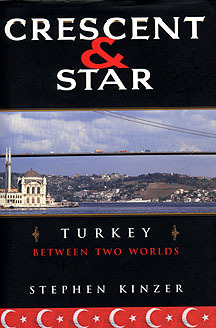 It’s sections on politics, of which there are many, are relieved by short glimpses into Turkish culture. While an article written in this heavy, fact-laden style may be good for The New York Times, a whole book of it can become tedious.